Successfully Added Left-Handed Security Lock - 63 Programmable Passwords, TM Card, 35 To 80mm Door Thickness, Battery Powered to your Shopping Cart. Suitable for left hand opening doors (hinges on the left when viewed from the outside) this security door lock is lets you leave the keys at home. No external wiring is required as this security door lock is powered by two CR2 3V batteries that are located and locked into the door handle with a special hex key. Together they bring about one year of use and there is a low battery warning light so you'll always be reminded when the need replacing. Operating on a TM card or 6 digit password and with memory to store 63 different codes this security door lock provides the ultimate security for your home, office or storage room. With anti spy code feature you can enter the 6 digit code within a 12 digit entry so prying eyes will not be able to decipher the 6 digit door code. 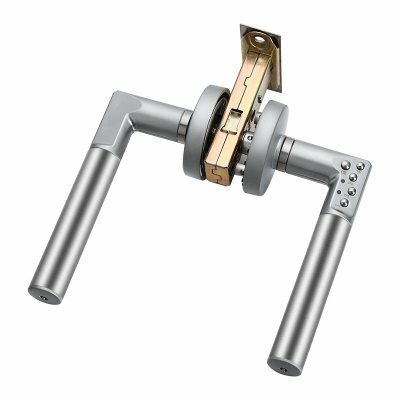 Adjustable to fit doors from 35 to 80 mm thick this security door lock comes 60 mm mortise latch, strike plate and is supplied complete plastic dust socket, strike plate and screw fixings so all you need are the batteries. This Security door lock comes with 12 months warranty, brought to you by the leader in electronic devices as well as wholesale electronic door locks and security gadgets..